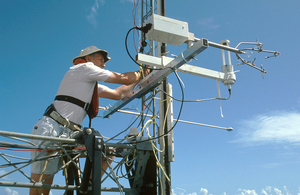 CSIRO Land and Water scientist Dr Frank Bradley installing micrometeorological instruments on the R.V. Franklin for a sea surface temperature experiment,1992. Photographer : Gregory Heath on January 01 1992.